Built on a comprehensive public engagement process, the master plan draws together the ecology of the site with the social and cultural life of the surrounding neighborhoods. New nature playgrounds provide important opportunities for children of all ages to engage with the outdoors. Stone structures and furnishings evoke native bedrock ledges in the ravine at the park’s northwest edge, while a swath of stormwater gardens recalls the historic trace of Beaver Creek. Plantings of native trees and meadow species enhance ecological vitality and seasonal beauty, and a curving allee of magnolias honors the planting scheme from Lay’s 1914 Master Plan. Interpretive historic signage links the many chapters of the park’s history to its importance in contemporary Albany. Lincoln Park is already a vibrant hub of active recreation, hosting a busy schedule of sports, fitness, and play programs The master plan expands the park’s capacity for year-round active recreation, while foregrounding the site’s natural history to craft a unique design language and celebration of place. 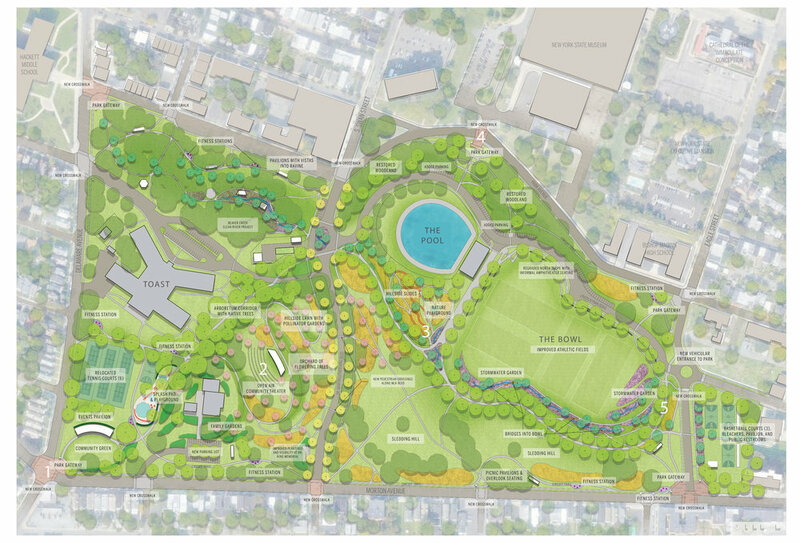 STIMSON and the Albany Department of Planning and Development prioritized the public engagement process, and accordingly, the plan reflects the specific needs, goals, and preferences of Albany residents. The result is a community-driven vision for Lincoln Park, that will preserve, connect, celebrate, and activate this cherished cultural landscape for decades to come.